I often receive calls from people wanting to gift a loved one with organizing, whether it be through a gift certificate or my completing the project as a surprise. 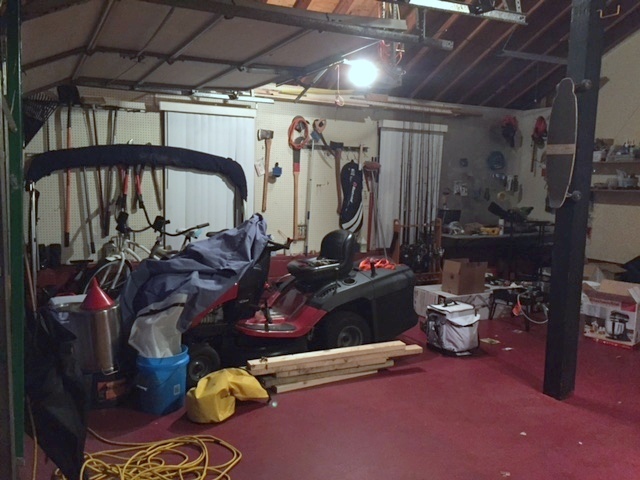 A few weeks before Christmas, I was contacted by a lovely woman who wanted to organize her garage as a Christmas gift to her husband. My first thoughts were: “What a gift!” The garage is the space that most of us cringe at the thought of conquering. This woman was up for the challenge. And she wanted to do it for her husband in order to take something off his plate and make his life easier. We did some consulting through the phone and email, came up with a plan of action, and while her husband was away on business I came over and we got to work! 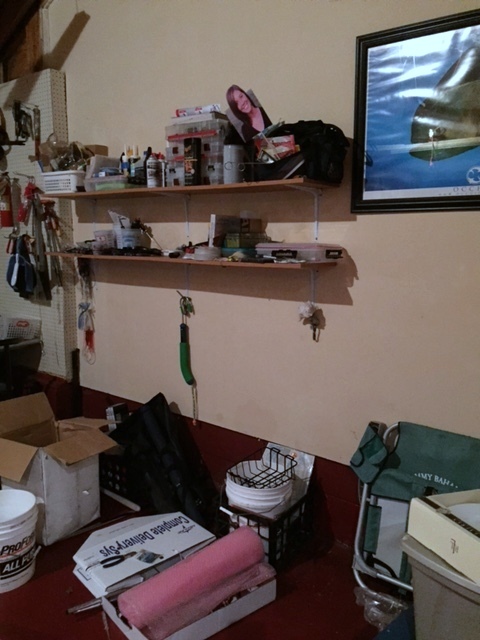 There was existing pegboard, some hooks, and a set of 2 floating shelves. We had a few things to work with. My client purchased a set of utility shelves, storage tubs, and a few pegboard accessories. We created zones, moved things around, and utilized new storage solutions. I am shocked that we finished in less than 3 hours! Though we went through the shelves housing all things fishing, there were a few small boxes of fishing gear for my client (and her husband once he was home) to go through before it was complete. Below is a picture before going through the shelves. When I went over for final pictures I was elated! Look at the fishing gear zone now! The tools were divided into two separate places, one being on the other side of the garage. We consolidated the tools and put the pegboard above the table to good use! Cleaning tools have their own spot. Yard tools have a place together as well. We took full advantage of the pegboard and hung everything we could, including beach chairs. One set of utility shelves was just right. Loose items are organized and stored in see-through totes for easy locating. Lastly and certainly most importantly: Her husband came home and was BLOWN AWAY! Perfect gift for him! Now they can both find everything they need right away, and don’t have to waste anymore time trying to figure out how to organize the garage. Its done! Everything has a home and all that’s required is putting it back after its used. Here are a few more shots of the transformation! I felt honored to be a part of this tremendous Christmas gift that brought much relief and joy to both the husband and his wife. AND THAT’S NOT ALL. There’s nothing like hearing it straight from the source! Go here to view my client’s testimonial video. Every client, every project, and every story is different. Each time I walk away with a renewed passion for helping people get organized so that they can spend their time LIVING. Is your closet driving you nuts? Do you feel like you have nothing to wear? Do you try again and again to bring some sense of order with no lasting results? Picking my brain for storage solutions. Hands on help with purging as we go through some of your clothing racks and shelves using my simple strategy. No hassle donating. At the end of the session, I will take all your unwanted items from the purge to be donated and mail you the tax receipt. You will be simply left with progress made in your closet. It DOES include my encouragement and professionalism. I DO want to help you figure out how to maximize storage in your closet. Walking into chaos everyday with no hope for solution is taxing. Mentally and emotionally exhausting. You don’t have to live that way. I DO want to help you feel confident in what you wear. Our closets, after all, house the very items that we utilize to express ourselves to the world. The items in our closet have the power to change the way we feel about ourselves, as well as how we present ourselves to others. Do you need help with a different closet? This special applies to any closet in your home. I can guarantee that MOST of you reading this post have enough. Particularly, enough STUFF in your home. Enough for you. And if some of you were completely honest, you have enough stuff for another entire family! Yet we all strive for more. MORE! And it clutters up our living spaces and interferes with our ability to do just that. The overflow of stuff interferes with our ability to enjoy doing life with those we love. Pick a few spaces in your home. Choose 1 per month for the next 3 months. Take an inventory of what is there. What are you using? What are you not using? Are there any 2 things that serve the same purpose? Get rid of some stuff. Donate the unused items. Donate the extras. Part with those things you spent too much money on. What is most important to you: Keeping stuff that is stressing you out because you spent a lot of money on it? Or feeling peaceful and at ease when you walk into your decluttered home where everything has a purpose and place? There you go. Decluttering, simplified. Start small. Build momentum. Relish in the victory. If you keep starting and stopping, if you are stuck, if you feel overwhelmed, if you feel like you need help, contact me! I offer consulting, as well hands-on organizing services. I also offer coaching if you feel that you can tackle on your own, but just need someone to track your progress, offer troubleshooting, and encourage you. Are you not local? No problem! I offer virtual consulting and coaching via phone, email, and video chat! I have never had a client that regretted reaching out for assistance. Don’t overcomplicate meal planning. You have enough on your plate. Feeding your family nutritious meals cooked at home every night is easier than you think. In this short video, Melissa shares her strategy for successful and simple meal planning. For tips on organizing your pantry, read Melissa’s post on Tackling Your Pantry. No doubt you’ve been evaluating this past year, looking at the goals you met and failed to meet. And with it I’m sure you’re making fresh new resolutions. While I don’t believe that the turn of a new year is the only time to make resolutions, I do feel it’s a natural time where we have elevated motivation to set goals and make changes. To gain closure and start new journeys. Though I do write out a list of goals for my business and personal life, I like to have one word to focus on for the new year. I get this word and incorporate it into all areas of my life. I think its a simple yet powerful way to start fresh. I want to give you one word for the physical appearance of your home and workplace in 2016. One word which I ask that you take a second to pick up like a pair of glasses and view your surroundings through. As you strive to purge and reorganize your home, keep this word in the forefront of your mind. Simple means low stress. Simple means less to manage. Simple means more time to do what you love. Simple means more time to BE WITH those you love. This is why I opened Simple Spaces 4 years ago (and gave my business this name). Its why I made my tagline: Get Organized. Simply Live. I count it sheer joy in helping people as they come out from under confusion, defeat, and feelings of being overwhelmed, and step into a place of simplicity and peace. A place where their home is serving their needs, and not the other way around. A place where people can be free to do what they love. Here’s to a great New Year of keeping it simple as you aim big with your dreams! © 2019 Professional Organizer, Home Staging | Simple Spaces|ProPhoto Photography Template by NetRivet, Inc.